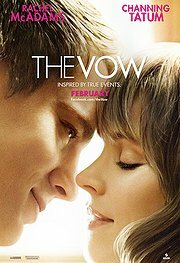 The Vow was made for the Valentine's Day audience. As I went into this movie on the evening of February 14th, the theatre was packed with couples. This movie gave them exactly what they paid for. There were plenty of cute moments that make you say, "ahhhhhh." There strange nostalgic moments that makes you realize exactly how much time Rachel McAdams forgot (wait for the moment when she turns to Channing Tatum and asks him who the President of the United States is).